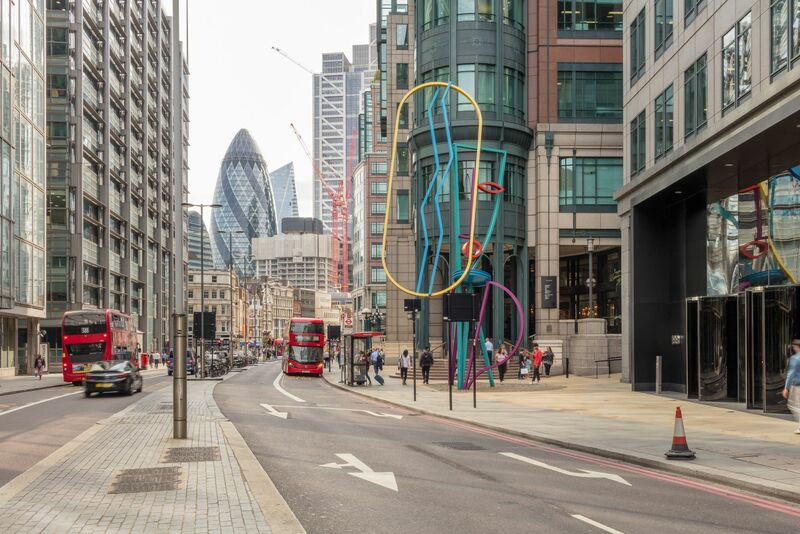 Escape the everyday and immerse yourself in a world of creativity on the Broadgate Art Trail. Free to view daily and set throughout the neighbourhood, this series of outdoor sculptures is the perfect way to sustain your positive and energised outlook. Join our Art Curator, Rosie Glenn, as she highlights some of our artists and their current projects. Why not take a look next time you’re out and about? Spending five minutes to immerse yourself in creativity could be just the thing to maintain your work-life balance throughout the coming year. Don’t miss Bruce McLean’s monumental Eye-I installation. Celebrated as one of the most innovative artists of his generation, McLean continues to develop his artistic practice in the form of installations and paintings. Towards the end of 2018 he presented Minimal Invisible Missing a series of new artworks at Wandsworth’s School Gallery and, at the start of 2019, showcased artwork with Bernard Jacobson Gallery in Mayfair. Also busy in the studio, he has recently released a series of screenprints with CCA Gallery. Keen to find out more? Follow him on Instagram and watch this video of his Artist Talk at Frieze 2014. 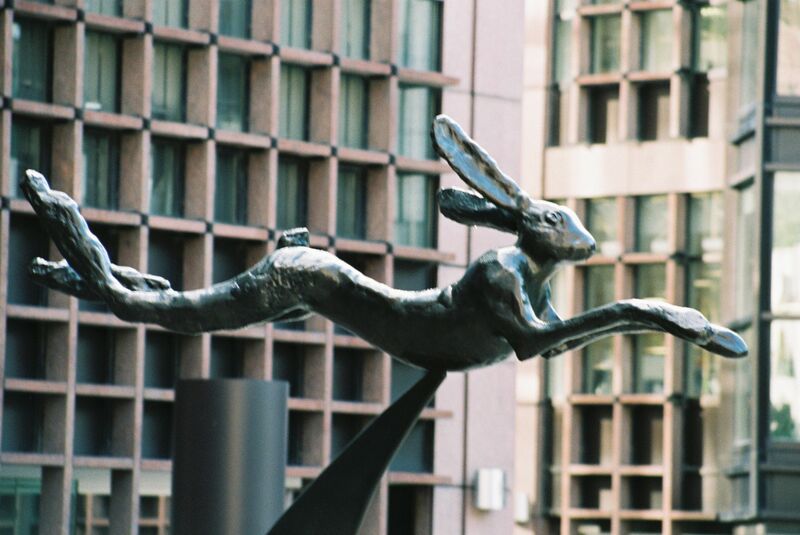 Energise your day with Leaping Hare on Crescent Bell by Barry Flanagan RA, Bruce’s good friend and contemporary at St Martin’s School of Art in London. Hare emblems played a prominent role in Flanagan’s oeuvre and, to August 2019, Acrobats 1997 is the key artwork on show in Follow that Hare at Warwick Arts Centre. Looking ahead, Birmingham’s Ikon Gallery is presenting a survey of Flanagan’s artwork; featuring earlier sand, cloth and rope artworks alongside later bronze pieces, this display reflects on Flanagan’s ongoing fascination with material. Interestingly, to demonstrate their enduring friendship, an interview with Bruce McLean features in the recent Flanagan monograph, published by Waddington Custot Gallery in association with The Estate of Barry Flanagan. Leaping Hare on Crescent Bell, Barry Flanagan, 1988. 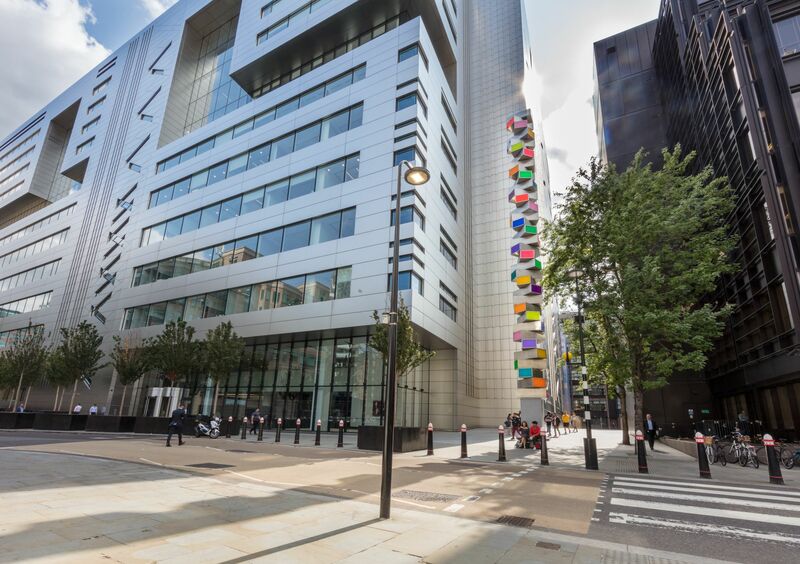 Our most recent piece of public art, Chromorama, by David Batchelor is sited on the Sun Street junction with Finsbury Avenue Square. Acting as a beacon and a meeting place, this artwork welcomes vistors to Broadgate from our surrounding neighbourhood. A well-respected tutor and artist, Batchelor currently sits on the judging panel for the 2019 Art Fund Museum of the Year, watch out for the winner who will be announced in July. Also, work by David is on show in PRISM, now on at The Glucksman in Cork. On your way to Liverpool Station, you'll find the architecturally proportioned Fulcrum by American sculptor, Richard Serra. At present this artwork is at the centre of Broadgate’s 100 Liverpool Street development plans and has been lowered, in consultation with the artist and his team. This engineering excellence has been undertaken in partnership with Sir Robert McAlpine. 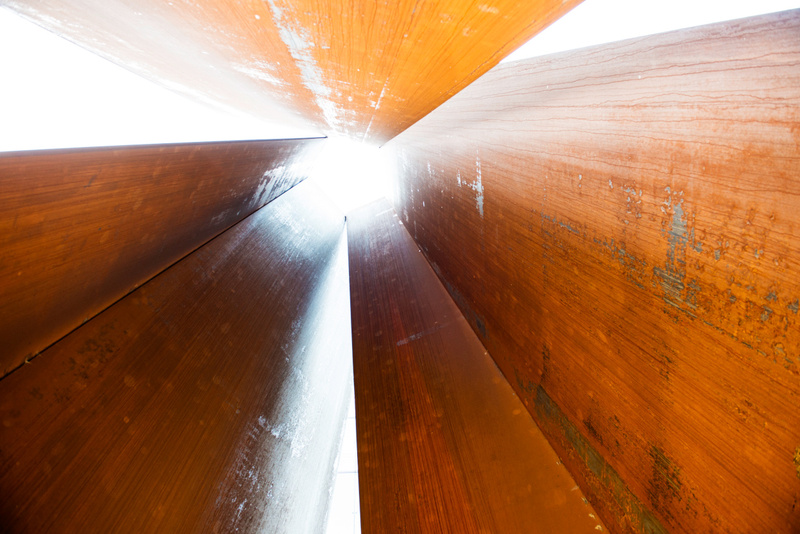 Critically acclaimed, Serra is showcasing work in Metal, an exhibition at London’s Simon Lee Gallery to 23 February. Inpsired? Take a trip around Broadgate on our Art Trail here. For news on our latest art exhibitions and more from Broadgate, sign up to our newsletter here. Share your images of our art with us by tagging @BroadgateLondon on Twitter and Instagram or by using #Broadgate.